Since there are some serious Uplay save issues these days(I have lost a whole day's saves just like that and I'm not the only one) I recommend that you turn off Cloud Save Syncronizatiom, you can find it by pressing the button in the upper right part of the uplay interface when you start the game. It will still let you play online except it prevents contact with Uplay Saving Profile Clients that seem to be currently broken. Saved game data is synchronized when you quit the game. If you find that your progression is not up to date when launching the game, try to exit the game and restart. This usually solves the issue. Also, make sure you allow enough time for the synchronization to take place after you quit a game and do not close the client before it is done. Edited by Storm-Giant at 19:39, 24 Jul 2012. A new version of the game will be released on Thursday, July 26th. Check out the details below and feel free to comment ! The player, his hero and units are hired as mercenaries by the Wolves Duchy to defend the empire against an odd Orcs invasion. 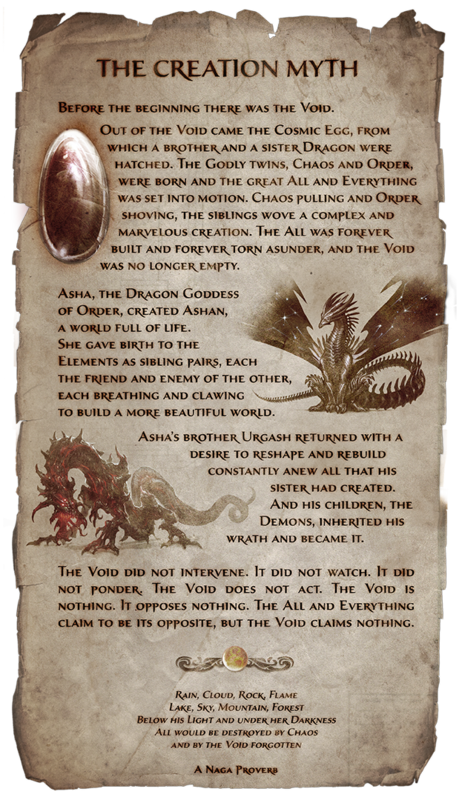 This contract will lead the adventurers to an epic journey where they will fight against many different factions, meet several characters and learn the new philosophy of the nothingness (also called Void). The solo campaign will help you evolve as a player by adapting your game to the numerous factions you will face. Moreover the campaign will allow you to win rewards and will immerse you deeply into the Might & Magic universe! A new tutorial, more complete, step by step, and clearer. The news won�t be written in English anymore, but according to your operating system�s language. When this mode is activated, the player encounters a second confirmation message before ending a turn. Players are now able to discuss with one another during a duel. In order to activate the chat, press the �Enter� button and then type the text you want. Enrage: when an enraged creature attacks, its rage counter goes down to 0. Several issues related to memory and game crash have been fixed. As you already know, the patch 1.5 and 1.5.1 have been released and we have been monitoring the official and community channels. We gathered a lot of feedback, thank you again for your help! The Limbic team worked hard to address different issues and now I can share with you the list of corrections we are going to implement with the patch 1.5.2. The list is not final yet and can be changed. We are aiming at releasing the patch onThursday July 26th. o Currently only the progress of unlocking the campaign maps gets synchronized. o Only progress that has been achieved while playing online will get synchronized. Campaign progress unlocked in offline mode is not synchronized. Progress that has been achieved while being offline is only available on that specific machine. o The progress will only be synchronized if it has been achieved with a default (online) hero. Progress that has been made with heroes whose affinity has been switched (e.g. from blood to tears) or with custom heroes will not be synchronized. o The progress of heroes (reputation/skill/level) within a campaign will not be saved/synchronized. o Fixed the trigger for the achievement "The seas run red". o The dialogue triggering the bonus reputation quest now appears in the course of the map, not right at the beginning. o Pendant of Conflux - Inconsistency between the tooltip and the behavior for the Pendant of Conflux artifacto The "Bracers of the Druid" artifact tooltips are incorrect. o The "Gauntlets of the Khan" artifact's second ability (+1 to friendly creatures might damage) doesn't worko The Cloaks that increase magic defense by 10 for each magic school don't worko The "Frozen Chrysanthemum" Artifact doesn't worko The "Boots of the Waverider" does not grant "1 creature movement on sea"
o The "Winterwind Peace Circlet" Artifact doesn't worko The "Flamegold Shield" artifact does not award fire resistance. o The "Pendant of Mastery" does not award a bonus to the racial gauge as stated in its description. o The "Shantiri Armor" does not grant magic defense against the Prime magic school even though it is stated to do so. o The growth for the "Harpy" unit is 7 instead of 8o The growth is 11 instead of 12 for the Demented. o The growth is 8 instead of 9 for the Maniac. o The "Toughness I" ability does not increase the maximum health of the hero's units by 5%. o The "Toughness II" ability does not increase the maximum health of the hero's units by 4%. o The "Toughness III" ability does not increase the maximum health of the hero's units by 5%. o Tree Of Plenty - The player placed on the first slot starts with the Main Hero on the central island. Edited by Miru at 03:52, 29 Jul 2012. I don't know if anyone else already knew this, but if you log into your account at ubi and go to the soulforge, you can upgrade your dynasty weapons without playing the game. You pick a weapon (one at a time) and then click upgrade and then some time later (10 min for level 1 > 2, 1 day for level 4 > 5) it upgrades. Makes dynasty weapons more practical for people who don't play much. Also the online altar of wishes implies there are items to redeem that can only be redeemed on the website, but it isn't loading for me. Allegedly, there will be a a lot to reveal about Heroes 6 at Gamescon. I don't expect anything other than Dance Macabre being announced. Edited by Grownock at 23:29, 03 Aug 2012. Online gaming site Eurogamer.dk have talked to UbiSoft concerning Pirates of the Savage Sea and their work with Limbick. The article is available in Danish here as well as a Google-translated version here. Don't think it contains any major news. An explanation on the Blood and Tears ending of H6, what happened with Cate and Michael. Edited by Thanir at 19:04, 21 Aug 2012. To better understand the last post.. it seams that Crag Hack has been driven out of the Possition of the Lengendary Veteran and A new mysterious hero has taken his place.. Any gueses who it might be? On the official forum, Limbic's CEO made a statement in which he said that given the code left by BlackHole, he cannot see how simultaneous turns or random map generator can be implemented. Edited by Elvin at 10:42, 23 Aug 2012. For those who missed it, the Might&Magic team from Ubisoft and Limbic will be playing online on August 23 and 24 (from 4 pm untill 7 pm CET). - tell us why you would like to participate in the online event. - On August 23 and 24 (from 4 pm untill 7 pm CET) invite one of these accounts to duel. Share your ingame login on Facebook to get a better chance to participate! So far there are 52 participants. No offtopic here please, this thread is reserved for news items only. 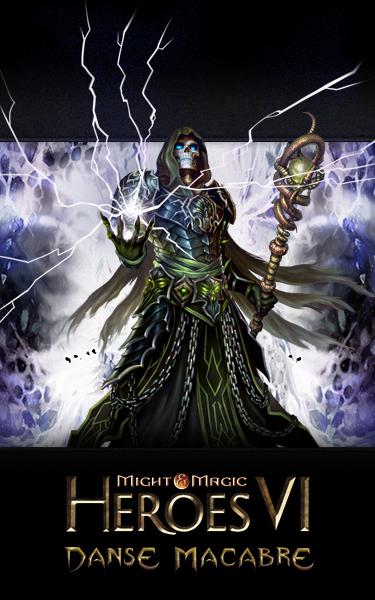 Today we are glad to inform you that the second Adventure Pack "Danse Macabre" for the universally acclaimed Might & Magic Heroes 6 as well as a Gold Edition, including the game and the two Adventure Packs, will be made available for PC on September 27, 2012. Developed by Limbic Entertainment GmbH in Germany, Might & Magic Heroes VI Danse Macabre Adventure Pack offers over 10-hours of epic adventure. The banished Might & Magic villain, the Great Lich Sandro, suddenly reappears with a vengeance to take on the world of Ashan and its dragon gods. - and an original pet. In addition to the release of this new content, a Gold Edition of the game will be in stores on September, 27 2012. This Gold Edition includes the original game Might & Magic Heroes VI, the two Adventure Packs and an exclusive new map. You will be able to take part in the infamous succession wars on this exclusive map based on the original Might & Magic world of Enroth. Might & Magic Heroes VI Danse Macabre Adventure Pack will be available to download for 9,99� on Ubishop, Steam and other digital retailers. The Gold Edition will be available for 39,99� in retail stores, Ubishop, Steam and on other digital retailers. Edited by Elvin at 11:35, 31 Aug 2012. CH: 1. Before we start properly, I've been meaning to ask you about your title � "Lead level designer". This isn�t just a fancy name for "map maker", is it ... what is it, exactly, that you do? What�s a normal day like for you? Marzhin: "My job as Lead Level Designer is a bit similar to what an Art Director is for graphic designers. So I�m supervising a team of designers and working on the �high-level� conception of the maps, but not (much) taking part on the actual map making (except when extra hands are needed to survive crunch time ). I am also a sort of �interface� between the level designers and the writers. So basically my job begins by meetings with the writing and creative team, discussing the kind of story they want to tell and how it could be translated into gameplay objectives. Once that�s done, I start briefings describing where the map takes place, the kind of geography, terrains, where the towns are, and outlining the main objectives of the map as discussed with the writers. With this briefing document, the level designers can start working on the map itself. While they do, I�m starting to draft a document called the Sequentials, which is basically a table listing all the narrative events of the map, and where they are triggered. This first draft will then allow the level designers to put �placeholder� events in the map, and the writers to start working on the dialogs. The Sequential also includes a list of all quests. Obviously there�s also some back-and-forth with the level designers, who will get back to me with suggestions to improve the flow of the map, ideas for secondary quests, etc. So I integrate these changes and additions to the rest of the documents. When the maps start to be playable, I�ll also play them and give feedback and suggestions to improve them. After that, the map is pretty much in the hands of its level-designer(s), but I continue to play the new versions of the maps as they come out and give feedback if needed. Aside from that �main job�, I also did some writing for Heroes VI (some artifact bios, a couple of signposts and lore texts), and I�m also involved in the reviewing process for all graphic assets." Marzhin: "This last year has pretty much been a roller-coaster. I think the high point was being trusted with the writing of the Adventure Packs. Writing is something I enjoy as much as designing a map, so I was immensely happy when Erwan Le Breton offered me to write Crag Hack and Sandro�s return." Marzhin: "No surprise there, I�d say the months that immediately followed the release of Heroes VI. As you probably remember, there were many issues to tackle. So the end of the year was pretty gloomy, and while we were determined to find a way to continue working on H6 no matter what, the future seemed uncertain at best. Fortunately the guys at Limbic rose up to the challenge." So to have the opportunity to make a �legacy character� (as we nicknamed the characters showing up in several Might & Magic worlds/games) the centerpiece of its very own product, that was a blast. And as I said before, it was an honor to be able to actually write their adventures myself. So yes, you could say it was my baby. However I wasn�t the only parent � the Limbic team gave an equal part of their hearts and souls to make this possible. Special kudos to Anselm, Karsten, Alexander and the rest of the team for their hard work." Marzhin: "Ubisoft wants to keep Ashan as the main world for their Might & Magic games, but they weren�t automatically opposed to bringing back the Ancient worlds as bonus �legacy� maps. One of the reasons they didn�t do it earlier was that they didn�t want to do it wrong and attract the ire of the fans (which was one of the main reasons for creating Ashan in the first place). While the �Princess of VARN� was about imagining a possible future for VARN, the XEEN map (�A Tale of Two Guardians�) is an (almost) straight retelling of World of Xeen. I preferred to tell the story of Corak and Sheltem rather than going into the future of XEEN since as you might remember after WoX it turns into something very different and I didn�t feel it was right to infringe into that unexplored territory. CH: 7. Fans were quick to spot the connection between the presence of Crag Hack�s helm in the game and his appearance in Pirates� There is a similar presence of an artefact set belonging to a "Great Lich". What can you tell us about this? (editorial note: these questions were submitted the day before the answer was revealed). Marzhin: "Well now that the Danse Macabre Adventure Pack has been announced, you know the answer. There are several hints about Crag Hack and Sandro in Heroes VI, actually. Crag Hack�s helmet, the Staff of Sandro, and some texts found on signposts foreshadow the Adventure Packs. Although at the time I included those �easter eggs� I didn�t know if Crag Hack and Sandro would officially return! But I wanted to include those hints to show these characters were alive (well for Sandro that�s debatable ) and active in the world of Ashan, hoping that maybe, one day, I would have the opportunity to tell their stories." CH: 8. Can you tell us what you're doing � are you working on more DLCs? Marzhin: "You know that�s not my place to say anything about that. Let�s just put it this way: Heroes VI does not end with Danse Macabre." Marzhin: "I still have a lot of work on my plate before that day comes, but there�s a pet project of mine I hope will become a reality somewhere in the near future. And that�s all I can say for now." Congratulations to Behemoth's Lair for celebrating its 14th anniversary They have asked some of the M&M crew to answer some questions, you can find the English interview here, scroll down a bit.